Android Studio is now the official IDE to create Android apps, so let's all of us get into the wagon to migrate from Eclipse ADT to Android Studio. As for me, Android Studio is very user friendly and not too different from Eclipse. If you've already been familiar with Eclipse, then you won't find any difficulties using Android Studio. It takes only a few days of learning to get yourself accustomed using the Android Studio. The first step to migrate is preparing the Android Studio. Just like Eclipse, Android Studio needs JDK, if you don't have it on your computer, then download it first. JDK version can be used for Android Studio is JDK 1.7 and newer. If you have already installed JDK and has set it up, now it's time to download Android Studio on the Android Developer Tools official page here. On the time you download Android Studio, it includes the Android SDK in the bundle. So you don't need to download it or install any plugins separately. Once you've downloaded it, click the .exe file (If you use Windows Operating System computer), then follow the on-screen instructions to install. 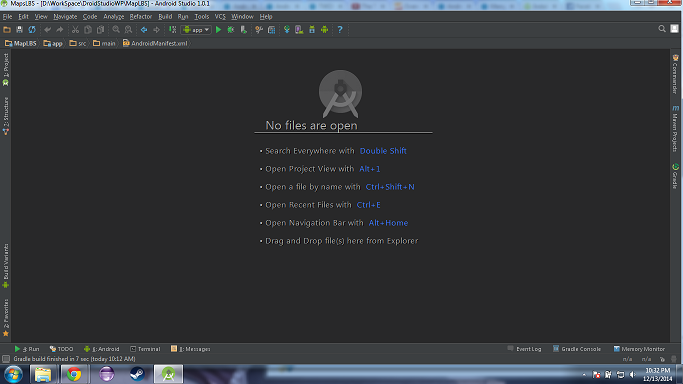 Once done, then you can directly enter the main page of the Android Studio. The interface of it is more or less like this. Now we can download Android SDK. 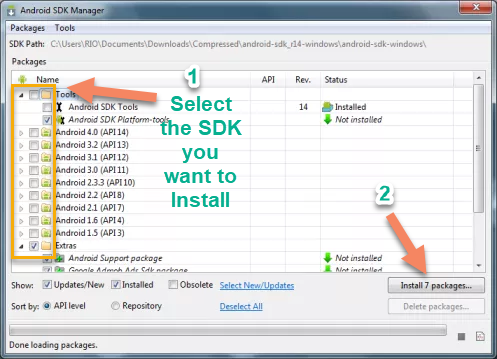 Download Android SDK from its official site here (758 MB). Android SDK is the pack of custom images files to be used to test Android app that run on the various version of Android. Android SDK also has a number of another tools needed to develop the Android app you are about to create. Basically to download Android SDK is similar downloading the same file on Eclipse. The exact steps to do so can be seen below. Step 1 -- On the Android Studio main window, choose Tools menu on toolbar, then choose Android -> SDK Manager, then you will find the following windows. Step 3 -- Choose Accept All. Step 4 -- Then click Install. Step 5 -- Wait for the downloading and installation processes to be finished. That's it. Now you have successfully installed Android Studio and have downloaded the needed Android SDK to create an Android application. That means you are now ready to create and develop your Android application anytime you wish using Android Studio. Read our complete guide to create Android application using Android Studio.